The image at right was in place this past Sunday (NZ time) morning, roughly 36 hours before Osama bin Laden was confirmed dead by President Obama. It’s a cricket field adjacent to the NZ National Botanical Gardens, where my brother Kevin and I would go to take Army physical fitness tests weekly while he was staying with us. It provides a timely entrance to my reflections on OBL’s death. Although it is tempting to respond to the nonsense that the image represents…(ok, briefly: what gains were made? How was it kept in secret? Why not fabricate definitive, conclusive evidence that Saddam was connected? 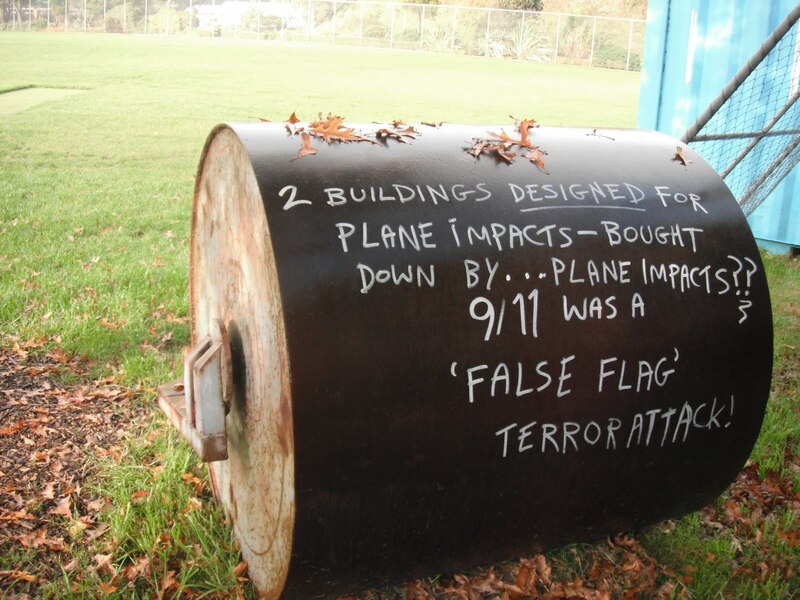 Why “false flag” our way into a costly attrition? )…I’ll leave the image be. However, it is indicative of a certain segment of society (both in NZ and around the world) that must be mitigated from an information standpoint. For example, with the death of OBL. So far, so good. The President’s speech was excellent, and the news coverage has been positive and informational (see this NY Times feature on the timeline and the graphic images of the raid). One thing that was, I think, noteworthy: upon logging on to the NY Times upon hearing the news (but before the President spoke), I read Ross Douthat’s column “Death of a Failure.” It’s heartening to know that an opinion writer had the foresight to know that, eventually, OBL would be no more. And that he ran with that thought, enough to provide some good analysis on the death’s meaning (in the end, not a whole lot). Taking that in mind, I have these few thoughts to offer to the many this occasion is generating. 1. The death has strategic-level meaning (depending on how well we manage the story and it’s effects), while the tactical-level remains largely unchanged (as evidenced by the reactions of these three soldiers.). One way to look at my comment on how well we manage the effects can be seen in the decision to drop the body in the North Arabian Sea. It was likely the least-worst of all ways to go about handling a difficult issue. Should victims of 9/11 have had an opportunity to view the body? Should the body have been held on to, for other reasons (not that I can think of any at the moment)? People will question the decision, but, it seems to have been the most prudent option. 2. Will the event galvanize the US in our efforts abroad, or give cover to “declare victory and go home?” Stephen Walt has written a column endorsing the latter, but concludes that it isn’t likely that the bureaucratic momentum that has been gained since 9/11 will allow such a speedy ending. I generally agree with this assessment. 3. This is a victory for sovereignty and nation-states. Despite Martin van Creveld’s assertion that states are no longer as relevant as they were in Clausewitz’s era, this win goes to the Westphalian system. One might counter that it took the US nearly ten years to find and eliminate OBL, a valid point. But, the fact that he was likely in Pakistan for the majority (if not all) of that period is a testament to the strength of the norms of statehood. Even as strong as the US is, it is very difficult to penetrate the sovereignty of another. 4. The amazing range of skills necessary to be the President of the United States. President Obama absolutely eviscerated Donald Trump at the 2011 White House Correspondents Dinner, turning The Donald into a laughing stock that will (likely) never materialize as a realistic contender for the White House. 24 hours later, he was addressing the nation and world on the results of the successful strike on OBL. Comedian and domestic politician to the Commander in Chief and Leader of the Free World all in one turn of the Earth. Impressive. The central point or challenge, I read, is that the US conducts an inconsistent (or, as you mentioned, hypocritical) foreign policy. My response: is this a bad thing? As long as in every scenario, our values and interests maintain central to our calculation in balancing ends, ways, and means (and the resulting risk is acceptable), we’ve done our jobs. That balancing will often lead us to different answers to seemingly similar challenges. For example, for a time, the US supported the apartheid regime in South Africa (out of fear of Soviet influence) and post-1989 has habitually called attention to human rights abuses in China (in fact, the State Department insists on yearly meetings on this topic). A cynic would decry this as “inconsistent,” but each situation is different, and cannot be assessed in a simplistic, formulaic fashion. I’m fairly certain a that a generally recognized truth in strategy is that there is no formula for success. The only nation to mind that has historically operated in that fashion is Switzerland – and we’re not Switzerland. The search for “a better peace” dictates an eclectic, situational-dependent approach, not a paint-by-numbers/if A, then B methodology. The inconsistent/hypocritical argument is not a substantive criticism, because variance and difference in policy is not wrong just for being varied and different. It might be sub-optimal for other reasons, but “inconsistency” is an insufficient argument at best, and, often, veiled anti-Americanism.